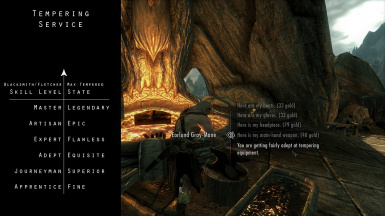 Loot and Degradation - the amazing immersion mod is now on Skyrim Special Edition. NPCs now have access to tempered/enchanted items that were previously only available to you. Tempered items no longer retain their tempered state forever. And a whole lot more. Read Mod Overview. You have my permission to translate this mod and upload it to the Nexus or non-English sites. Just send me a link. This mod has to be also linked in the translation mod and this mod must be the mandatory requirement to use the translation mod. The OG Mod Author - The Awesome Isoku. psychosteve for the widget icons. Added timed function to the widget hotkey. by the player but now applies to NPCs killed by anything. Optimized and fixed a few issues related to the NPCs Loot feature. Fixed a few minor MCM issues. Fixed an issue where tempered equipment looted from NPCs were predominantly found at 100% health. I am not the original author of this mod. This mod is the work of the super cool isoku and I have obtained written permission from the OG author to use, port, maintain, modify and develop this mod for Skyrim Special Edition. Even then, if the OG author finds this mod in violation of their terms, they have the right to BURN IT DOWN! forever. All features can be adjusted using SkyUI's MCM. from any mod as long as they have been added to the leveled lists. common followed by "Fine", "Superior", "Exquisite", "Flawless", "Epic"
loot items that may help them immediately. the rate at which the weapon degrades. hit by power attacks can significantly degrade armor. configured to display anywhere on your screen. Requires SkyUI. These features can also be enabled for followers. the only blacksmith who can temper artifacts or other unique equipment. than their current skill level. will deliver your improved items to you. 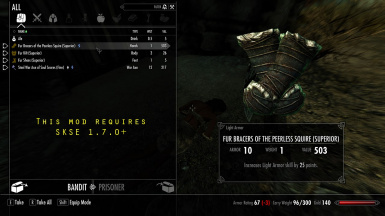 Works with all mods that add new weapons/armor/NPCs without the need for patches. unique from each other even if they look identical in your inventory. weapon of a certain type from your inventory. You should always use SSE Engine Fixes when playing Skyrim Special Edition. SKSE64 has a current bug with this mod but it can be taken care of with a small change in the INI file of SSE Engine Fixes. You have my permission to translate this mod and upload it to the Nexus or non-English sites. Just send me a link. This mod has to be also linked in the translation mod and this mod myst be the mandatory requirement to use the translation mod.